The Volatility Index, or VIX, has risen above 20 levels in last one week, raising alarm in the market as a rise in this gauge usually hints higher risks. But, an advancing VIX can also be a contrarian indicator as the market in recent years has mostly rebounded whenever the index crossed 20. 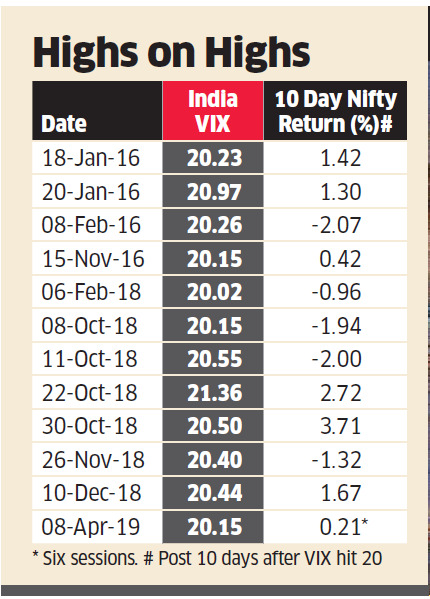 Data from 2013 show that when India VIX crosses 20, the Nifty has given positive return in the next 10 days for 55 per cent of the time. The volatility index has risen from 15 to 21 levels in last one month. VIX has made high of 22.24 during the day which is the highest levels since October 31, 2018. The recent high of VIX was at 24.04-mark, which was in the month of February 2018 when the government imposed the Long Term Capital Gains Tax in the Union Budget. This time, the VIX is rising as a huge jump in options premium was seen in the May series contracts, with the expected swing of more than 500-600 points based on the outcome of election result. Higher VIX suggests that traders expect volatile swings as option writers have started to charge more premium ahead of the general elections. “Higher VIX suggests that a volatile swing cannot be ruled out and risk is rising for taking fresh positions at current zones after the strong movement of around 1,150 points,” said Chandan Taparia, AVP, Motilal Oswal Financial Services. “However, a higher VIX suggests more momentum in the market and if the index manages to hold above its life-time high of 11,761, then higher VIX could even help the market to move immediately to test fresh high zones towards 12,000,” said Taparia. Analysts do not expect VIX to rise significantly from current levels beyond 26-28. In the previous election, VIX had touched 39.3 in May 2014. “Because of higher VIX, option premiums are higher by 25-35 per cent as compared to general option premium and time decay is hurting more as relative premium has to decline higher in such a market scenario,” Taparia added. Many traders have started to buy 11,500 put options or bear put spread of 11,500-11,000 for hedging their portfolio, expecting the index may find support at those levels if something goes wrong.